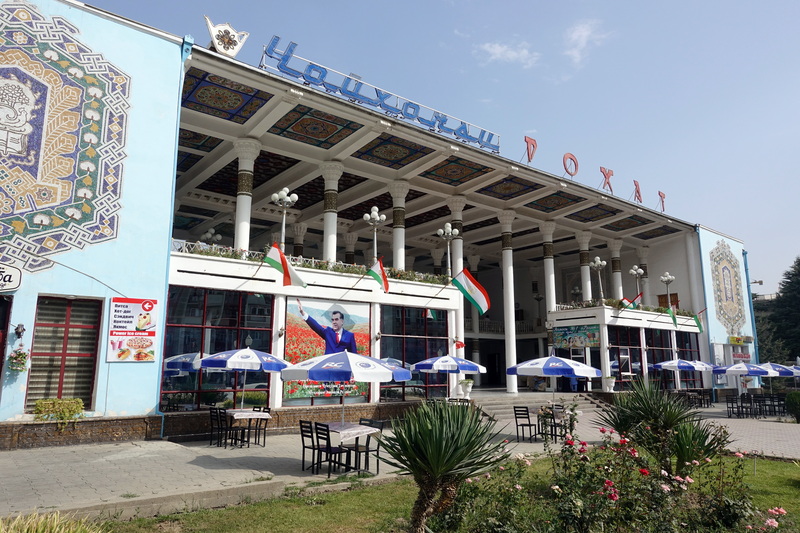 Dushanbe – the capital of Tajikistan – was a surprising city, and very welcome after 6 weeks in remote corners of Kyrgyzstan and Tajikistan. 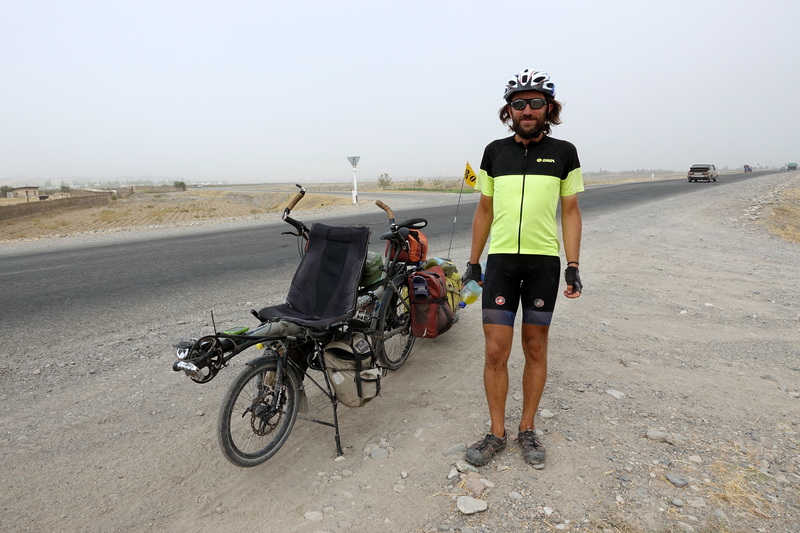 We had climbed an uncountable amount of mountain passes, totaled over 35000m of elevation gain, cycled over 2000km with over 850km on dirt roads, some parts barely ridable, other sections with over tens of continuous kilometers of washboard, and spent a week riding at over 4000m. 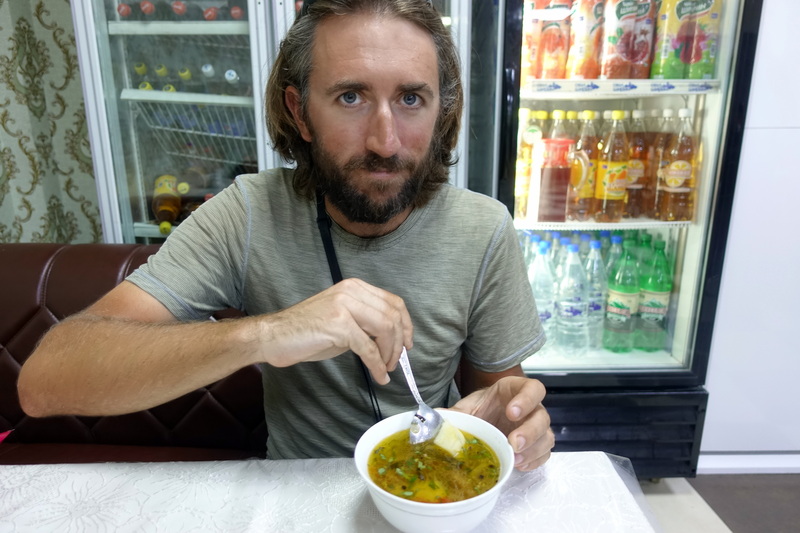 The food had been very limited, partially because of the difficulty to get anything in small towns, because the altitude is both exhausting but also hunger-cutting, and because riding through the Pamirs and those regions of the Himalayas also imply a culture-shock (!) for our digestive system – even though we got lucky to not get anything serious, our physical condition had got its toll. Only one thing on his mind – food! 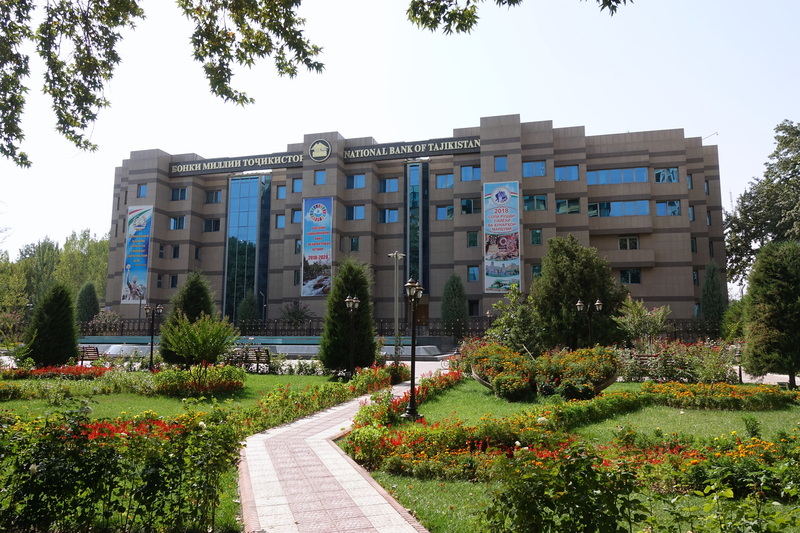 The landscapes and scenery had been among the most dramatic and remarkable that we had ever seen but arriving in Dushanbe we just need something: rest! 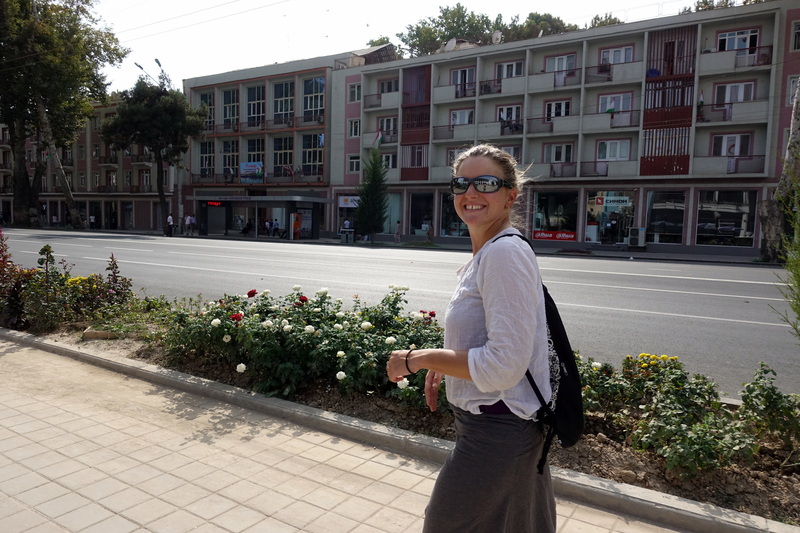 From our original plan to only stay two days in Dushanbe (which would be largely enough for short “regular” tourism), we decided on arrival to double the length of our stay. Our first day was focused on enjoying the bedroom and snacking until noon, followed in the afternoon by the objective to repair the bicycle. The roads had affected us, but also our ride, and we had to fix or change multiple items – breaks, tires, chain, cleaning, degreasing, lubricate, gearbox maintenance, etc. and among others the broken axle from Kyrgyzstan whose temporary fix had yet amazingly done 1500km. We were nevertheless extremely happy to see that the original part (and hopefully more reliable than our disc-saw, welding, tie rap, rope and metal binders MacGyver fix) sent by Cedric’s parents had arrived on time in a record-breaking two weeks from France (postcards and previous parcels often took months). 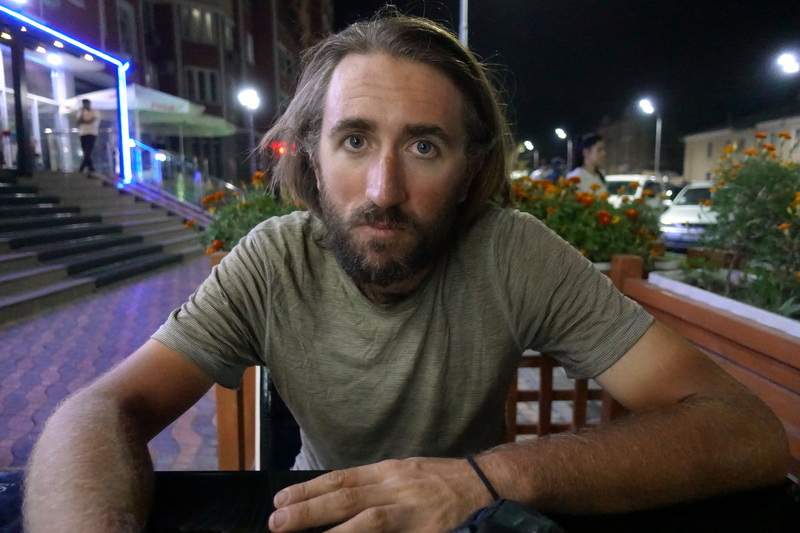 We had multiple spare parts, but we as usual the parts breaking are always the ones you did not take, so we also had to crawl through the bazaar of Dushanbe and a bike shop around it to find some additional pieces. 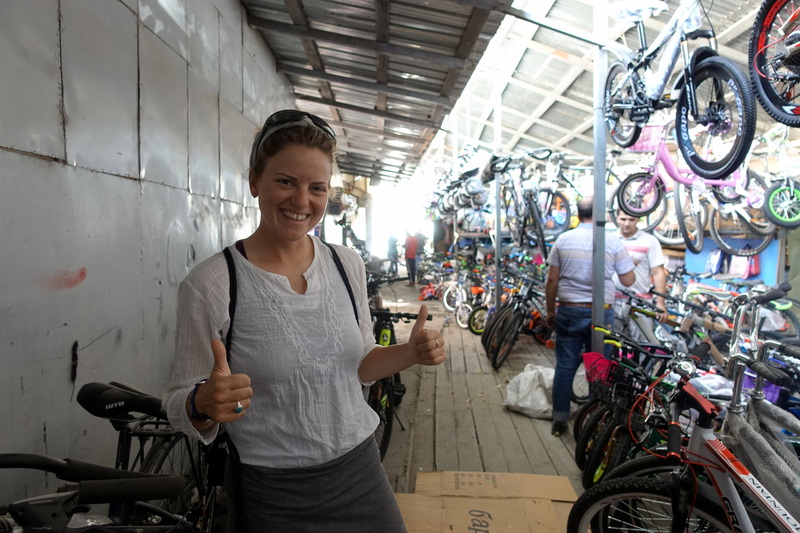 We found the ‘bike part’ portion of the bazaar! New, old, and random parts – almost anything is here. 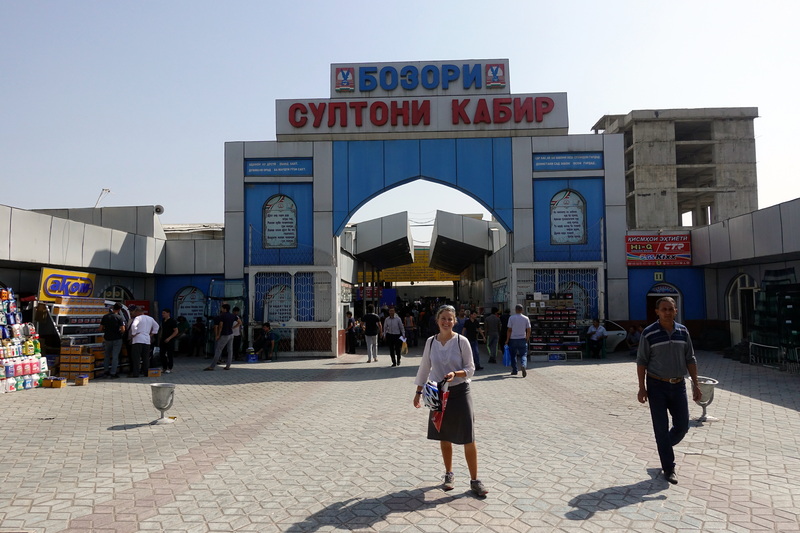 If any cyclist reads this blog, there are relatively good bike shops and bazaars in Dushanbe – it is not a miracle, but compared to all other cities visited previously in Central Asia (apart from Almaty), you will be able to find genuine new parts (Osh was more a dusty pile of decades old used Chinese knock-offs), also for example for hydraulic brakes or cleat-pedals. 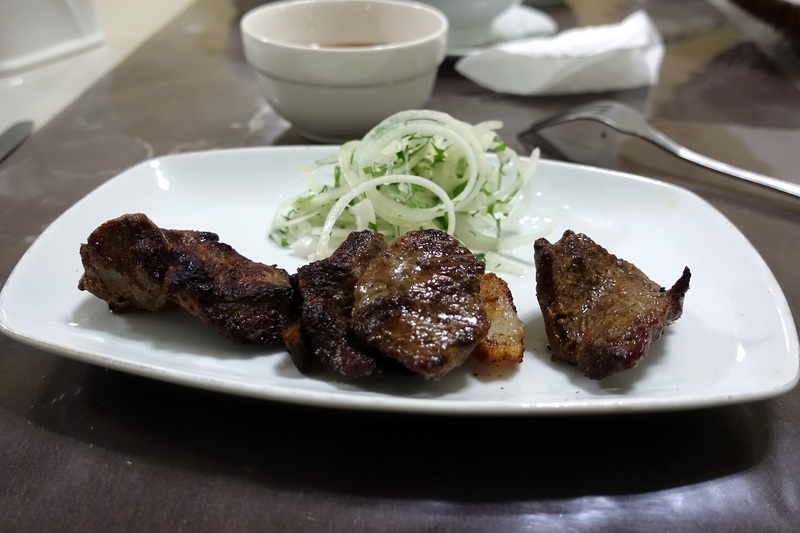 It may sound weird, but we also took the opportunity in Dushanbe to only eat at every single meal non-Tajik-traditional food, and got satiated by western fast-food, Turkish or more elaborate dishes. It is not that the Plov is too bad, but after weeks of having the same dish up to three times per day, we just needed to get anything else but that! In case you had never heard of it, Plov (rice “Pilaf”) is THE “national dish” of every single nation in the region: basically a lot of rice with some carrots, altogether fried in fat, with a piece of meat – usually mutton – on top. This is served and eaten pretty much anywhere, people eat it every day, but is also the dish of various celebrations, from weddings to funerals, locals want to invite you to try the national dish (in case you took an UFO directly to their place), restaurants (when you have a choice) recommend to take the homemade Plov, and pictures of it appear on any tourism promotion board. Again, not bad, but it feels a bit much for our equivalent of spaghetti and tomato sauce… the main difference between recipes seems to be the percentage of rice versus other ingredients, if the meat has any nutritional value (you may envy the dog eating the bones in some places) and the if the oil or fat used is going to give you burps for the next few hours (for example the cottonseed oil in Uzbekistan… I suppose it still tastes better than mineral oil). The second day was Cassie’s birthday! A new decade starting while traveling – that’s probably the best of gifts, right? So logistical issues, with a strict control of stuff we carry around meant that Cassie’s present was not going to be materialistic. 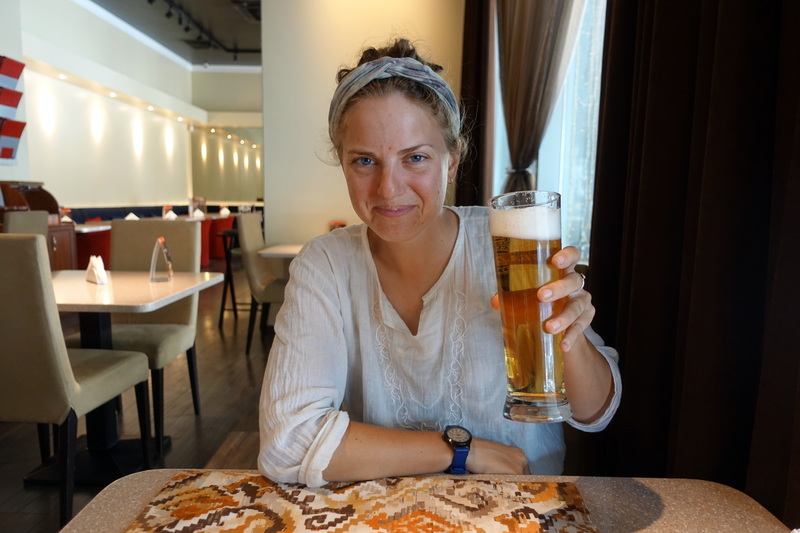 First enjoying a lazy morning, followed by lunch at the fanciest restaurant in the country with a few draft-beers (something rare in Tajikistan) – and yet the bill remained smaller than a fast-food feast back home, so we may have to celebrate 30 ¼ in a few months back in Europe! 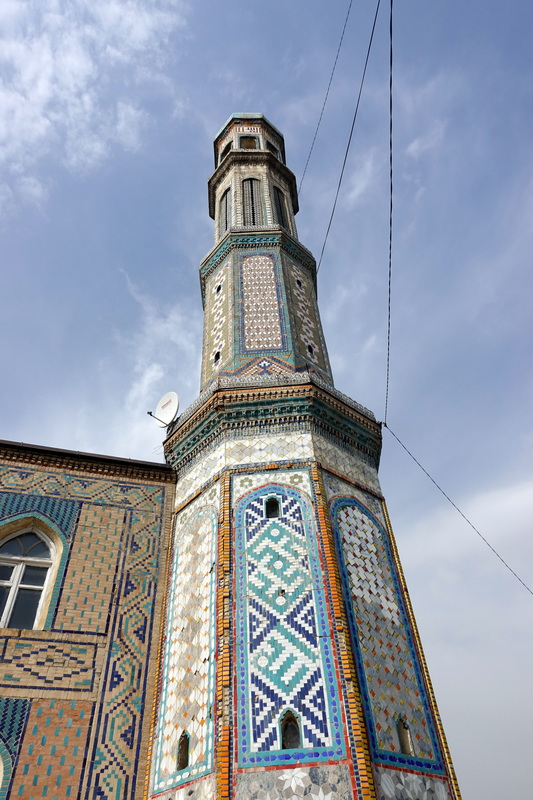 We spent the afternoon wandering around the center of Dushanbe, enjoying some green parks, extravagant waterfalls, and exuberant buildings. 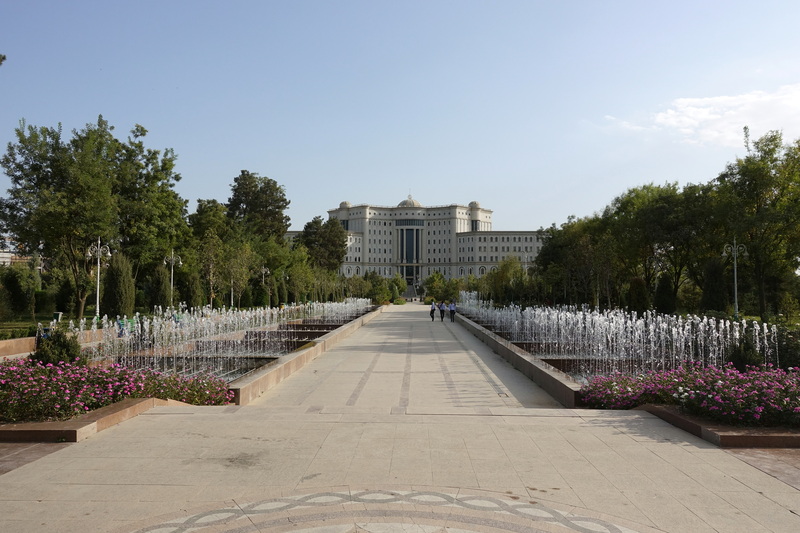 Tajikistan may have big economic plans for the 21st century given the size of the presidential palace (Versailles would seem like a cabin next to it), or various ministries (the ministry of foreign affairs may notably soon be a major diplomacy and intelligence hub!). We limited our walk to the center, not interested to see every administration architect-visionaries, and still focusing on our objective to rest. It was still enjoyable to walk on large sidewalks, enjoy large trees and simply have a few days not in the mountains! The grape harvest of our hotel’s courtyard. 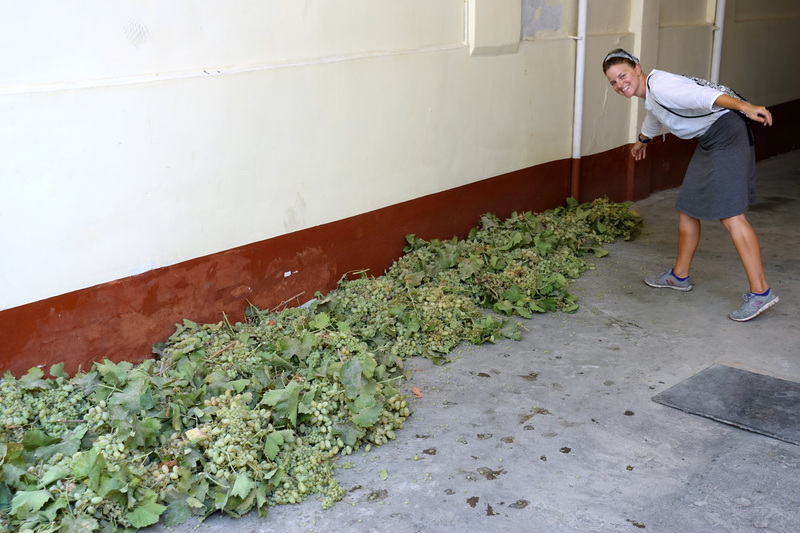 We had a loooot of grapes offered during our few days in Dushanbe! The third day was a big success for that objective because we literally did not do anything for the whole day, so much that it was the first day in our trip where we did not take a single picture – only eating, sleeping, reading, updating the website. We decided to get dinner at sunset at a restaurant where we had already been previously (no willingness whatsoever to try or look for something new) and got joined by a local student trying to improve his English. Apart from language barriers making it a very (very) slow conversation, we had to think every single of our answers twice and be over cautious: our views of society, culture, religion, role of women, etc. were miles apart. It was not just about having different ideas, but more about him not understanding that things can be different elsewhere. Similar to Kyrgyzstan, we felt that remote mountainous regions were indeed often more respectful, more egalitarian and progressive than the elites in the cities (and particularly males). The Pamirs were a lot poorer, people seriously struggling to survive, but we yet never had occurred awkward conversation there. 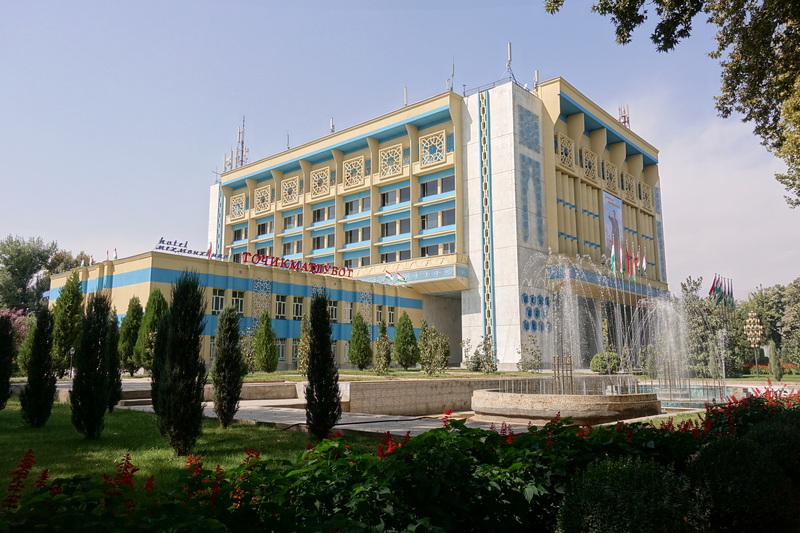 From simply talking English to a local student, we realized that Tajikistan may need a bit more time to have its shiny administration building becoming more transparent and democratic. The presidential palace. 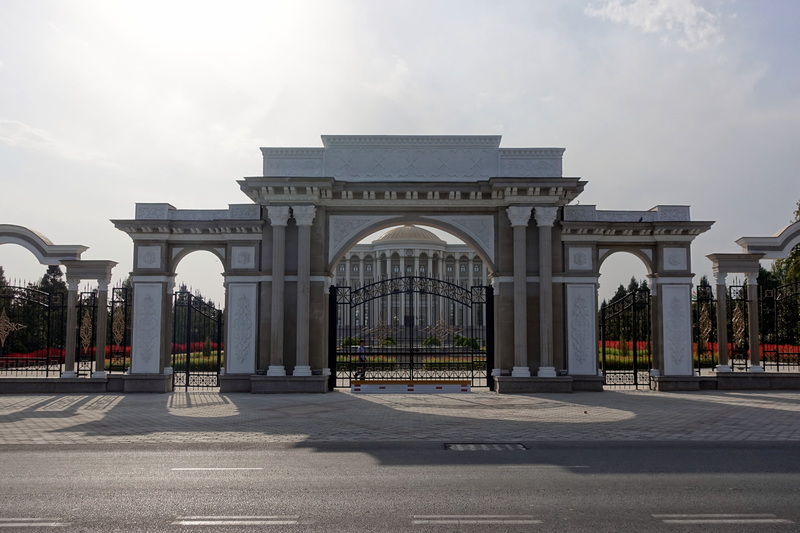 Cédric snapped this picture before getting yelled at by the guard – not sure what’s so secret about that building (except being worried that another Central Asian presitator may compete in the largest-palace-challenge?). This is the world’s tallest flagstaff, folks. 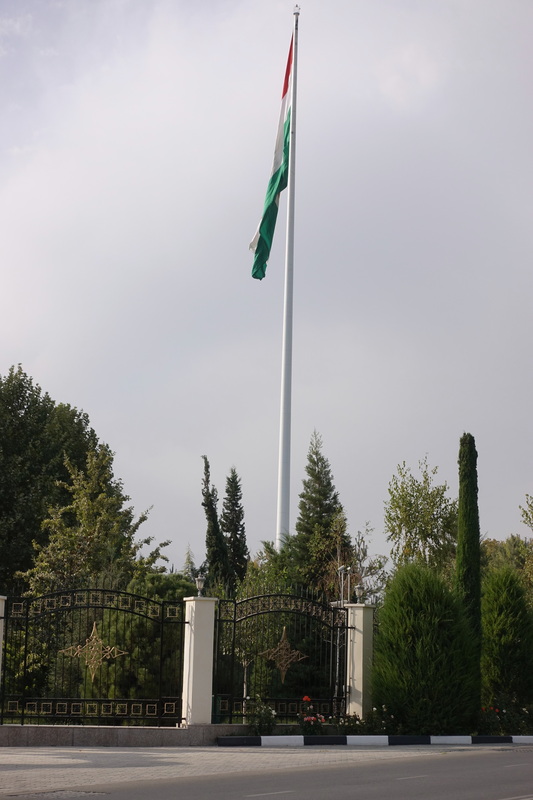 We finally left after a fourth comforting night, this time with a new objective, our next country Uzbekistan. There are two roads heading there from Dushanbe, either a more mountainous one staying longer in Tajikistan but arriving directly in Samarkand on the Uzbek side (a famous touristic place that we intended to visit), or a shorter route in Tajikistan, but yet hillier and longer on the Uzbek side. Both roads are nicely paved and about the same distance, but we felt like we wanted to have a new type of scenery and decided for the road leaving Tajikistan faster. 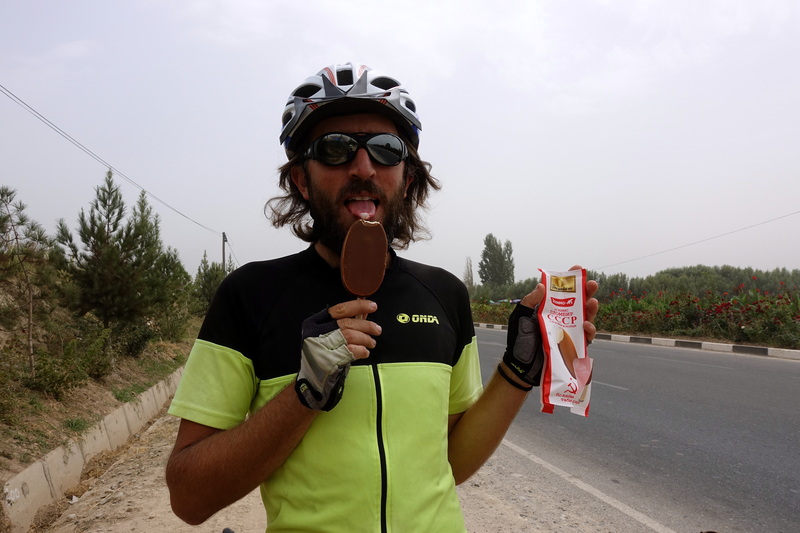 The ride out of Dushanbe was first a slow descent, later helped by strong tailwinds, so we cruised to the border in no time, also supported by a food truck who offered us chocolate ice-creams – and that replaced our lunch! 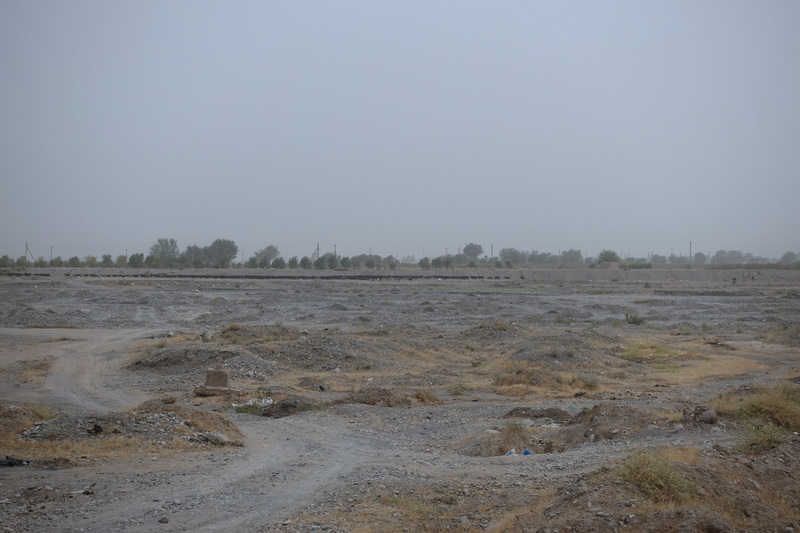 That border going from Tajikistan to Uzbekistan is supposed to be challenging since Afghanistan is not far and the border control guards are looking drug-smuggling. We however left Tajikistan almost without seeing anyone, and just managed to get our exit stamp at the last booth, on the Uzbek side the only questions we had, apart from how we can possibly remain stable on our bike (and the necessary demonstration followed by phone pictures), were about Eminem (Detroit), all the soccer players of the Bayern Munich (Germany) and – we had to answer those questions with a “yes, sure!” and a big happy smile because we have no idea whatsoever. 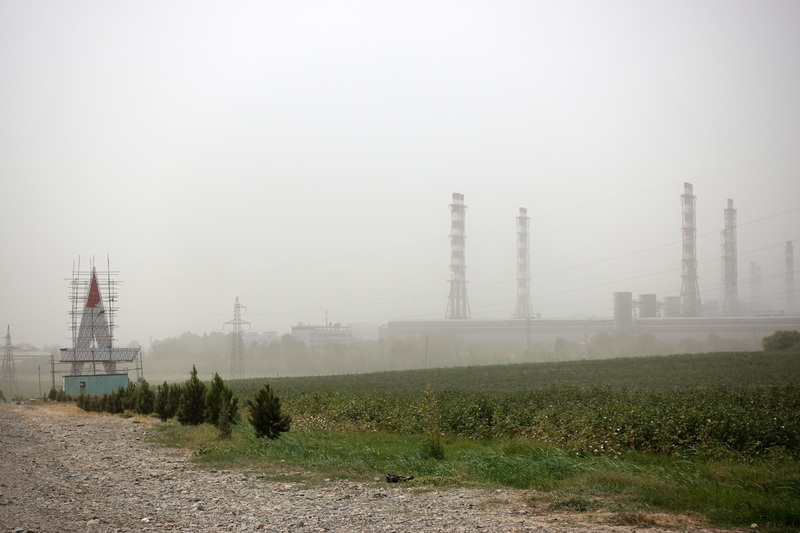 The first sight of Uzbekistan was surprising because we had a sandstorm making the landscape look like an industrial post apocalypse: abandoned soviet area vehicles and buildings with only a few silhouettes of cattle visible through the dust and the wind. We’ll always accept USSR-themed ice cream from strangers! 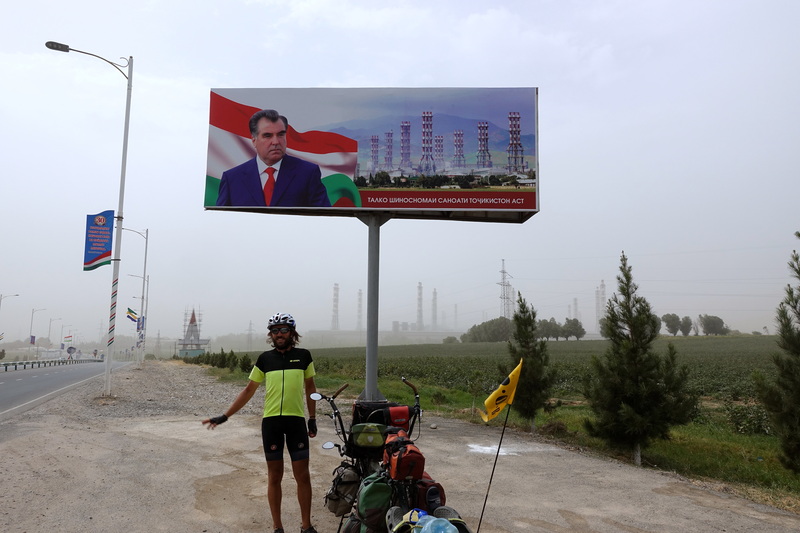 The background (an aluminum smelter, literally the only industrial complex in Tajikistan) is supposed to look like the poster on a good day. Sandstorm! Not to mention the great scenery going towards Uzbekistan. 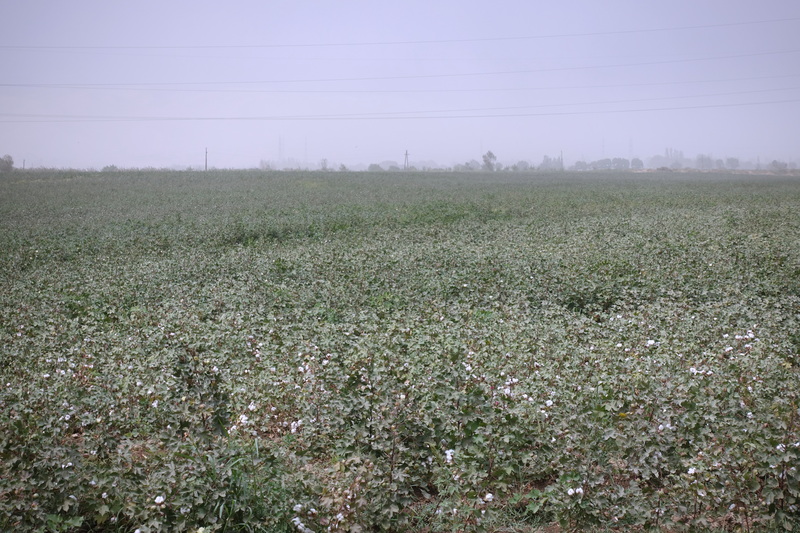 Ah, lovely Uzbekistan – we were welcomed with the best views. It felt a little like being in the decor of Las Vegas from the movie Blade-Runner-2049. Not yet completely covered in sand! Luckily the road was still flat, and we could keep up a decent pace. We arrived in the evening in Denau, looked for a hotel that could do the famous Uzbek registration (Uzbekistan has kept a lot of Soviet habits and tends to overcontrol anything in the country), where tourists must sleep every night in an official hotel and those hotels have to “register” you and your passport, and you get a flyer proving that you slept somewhere. Because there is a discrepancy between the official rules and the way they are applied in Central Asia (mostly based on the level of corruptness or laziness of the police officer), a registration every three days is usually enough. Denau being our only chance to get a hotel before Qarshi, 300km further, we had to commit to the rules. The risk being to not be able to leave the country, having the next hotel refusing you just because the previous hotel was too long ago (sounds crazy but it happens) or having to pay a hefty fine on departure (although the customs seem to target tourists rushing to get a plane, risking to have some cyclists camping at the border usually will make them surrender). 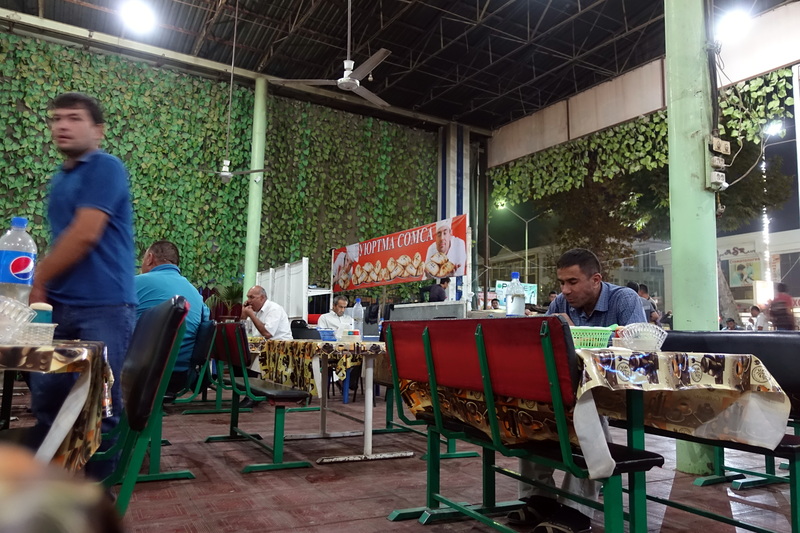 We spent the evening around town, finding the new subtleties that we will have to adjust to in the next weeks – it felt similar to Tajikistan, but not entirely. 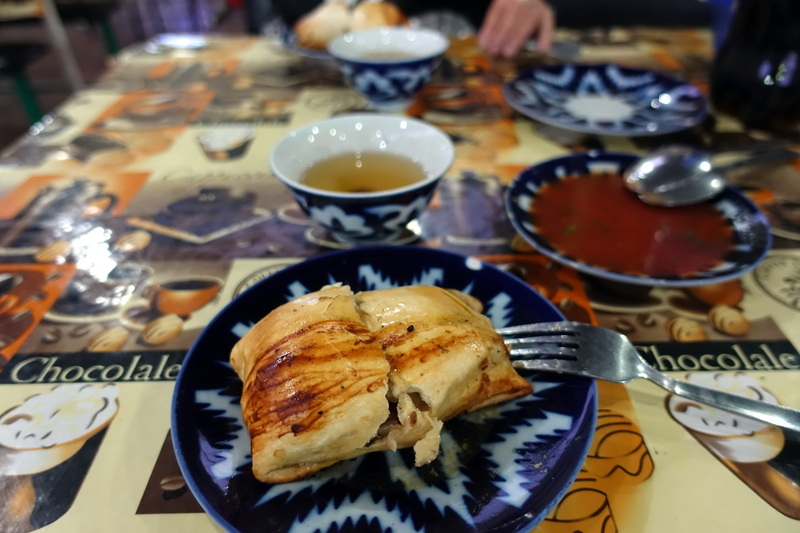 Uzbek (mutton) samosas in Denau (the Soviet-recipe has remained the favorite: a lot of oil, with onions covered with oil and a fatty piece of meat): slightly heavy and roborative! So glad you are out of the areas of isolation for now. Amazing landscape! You both look great and Happy Belated Birthday, Cassie. Celebrate it as often as you can. Photo of Cedric at the beginning of this blog post – you’re looking a bit weary there . . . But hey, some good ol’ western fast food (even though it may not be the healthiest alternative) should have put a smile back on your face! Pizza is known to make one smile too! Cassie, not looking a bit weary – you hide it well! Looking forward to celebrating belated B-Day’s with both of you!